pcolor(): draw a pseudocolor plot. pcolormesh(): draw a pseudocolor plot (faster version for regular meshes). plot(): draw lines and/or markers. scatter(): draw points with markers. drawgreatcircle(): draw a great circle. Many of these instances methods simply forward to the corresponding matplotlib Axes instance method, with some extra pre/post processing and argument checking. 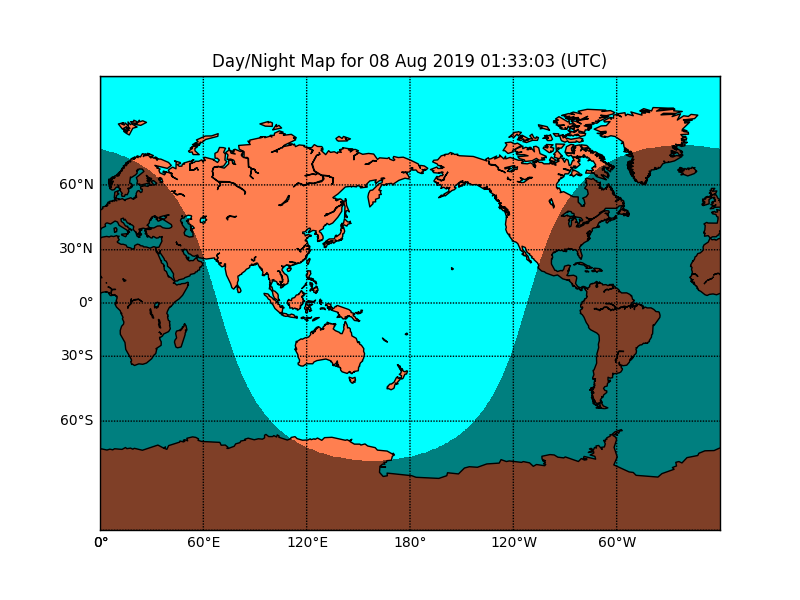 You can also plot on the map directly with the matplotlib pyplot interface, or the OO api, using the Axes instance associated with the Basemap. For more specifics of how to use the Basemap instance methods, see The Matplotlib Basemap Toolkit API. # perspective of satellite looking down at 50N, 100W. # use low resolution coastlines. # draw coastlines, country boundaries, fill continents. # draw lat/lon grid lines every 30 degrees. # make up some data on a regular lat/lon grid. 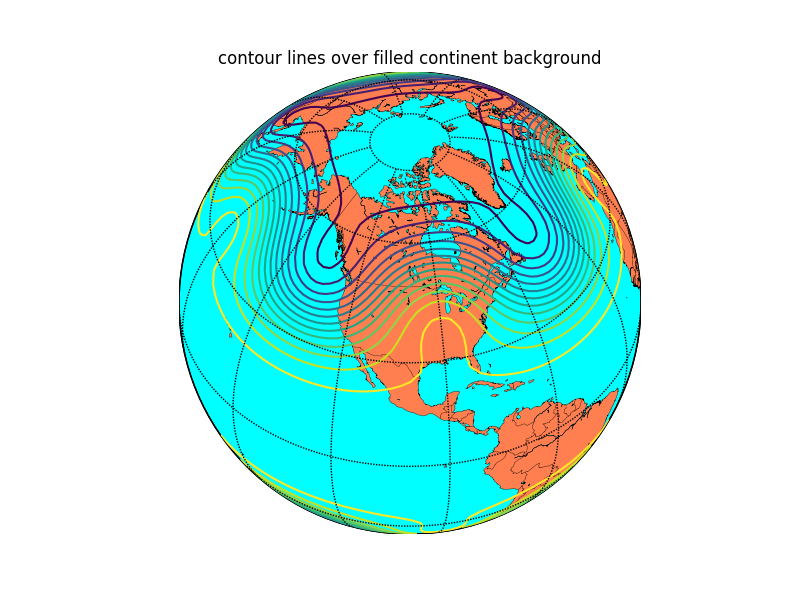 # compute native map projection coordinates of lat/lon grid. # contour data over the map. # colormap used by the NWS, and included in basemap. # create polar stereographic Basemap instance. # draw coastlines, state and country boundaries, edge of map. lons, lats = m.makegrid(nx, ny) # get lat/lons of ny by nx evenly space grid. x, y = m(lons, lats) # compute map proj coordinates. # plot 00 UTC today. # read prmsl, convert to hPa (mb). # the window parameter controls the number of highs and lows detected. # add wrap-around point in longitude. # find x,y of map projection grid. # plot lows as blue L's, with min pressure value underneath. # don't plot if there is already a L or H within dmin meters. # plot highs as red H's, with max pressure value underneath. # Lambert Conformal Conic map. # find names of storms that reached Cat 4. # only use named storms. # plot tracks of those storms. 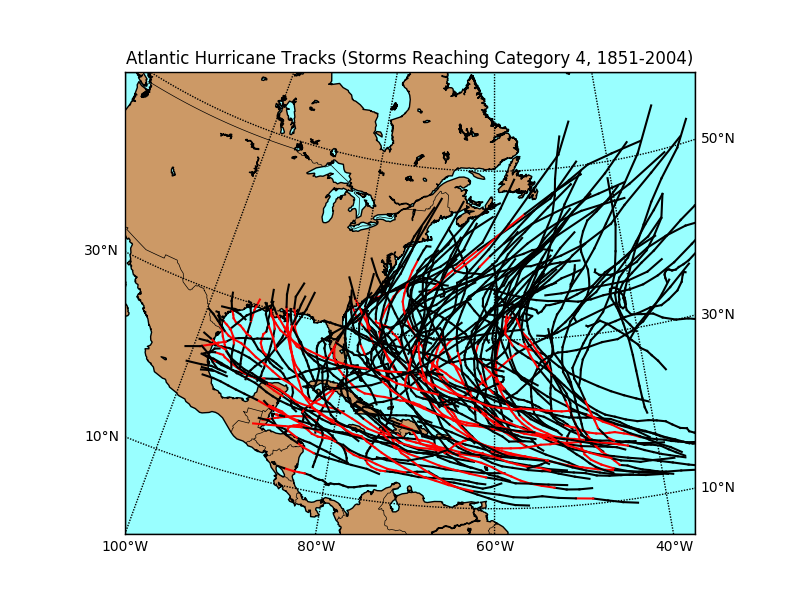 # show part of track where storm > Cat 4 as thick red. # draw coastlines, meridians and parallels. Plot etopo5 topography/bathymetry data as an image (with and without shading from a specified light source). # read in etopo5 topography/bathymetry. # shift data so lons go from -180 to 180 instead of 20 to 380. # plot topography/bathymetry as an image. # create the figure and axes instances. # setup of basemap ('lcc' = lambert conformal conic). # use major and minor sphere radii from WGS84 ellipsoid. 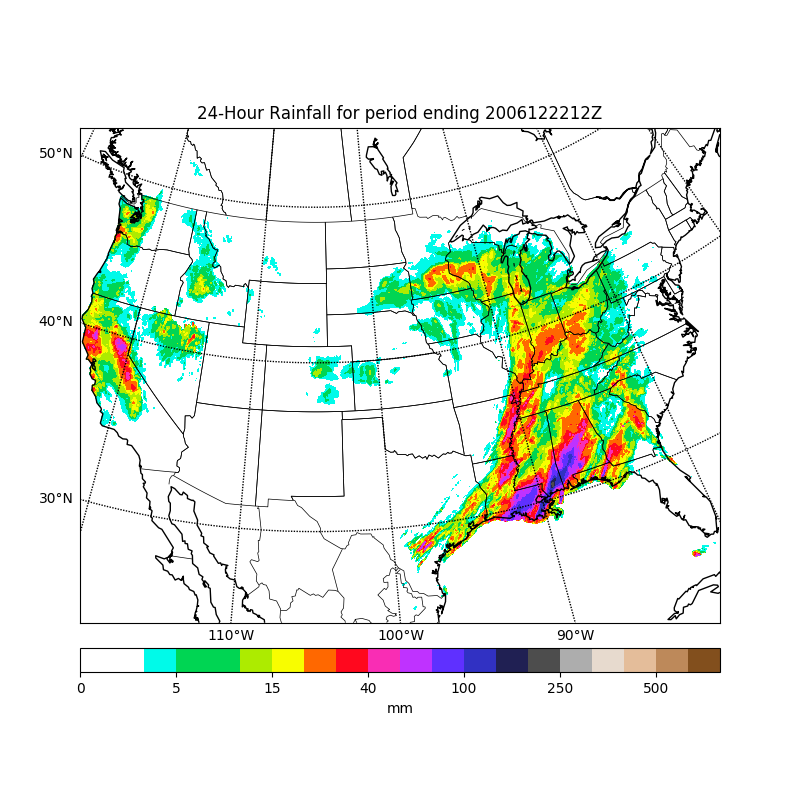 # plot image over map with imshow. # draw coastlines and political boundaries. # label on left and bottom of map. # make a shaded relief plot. # create new figure, axes instance. # attach new axes image to existing Basemap instance. # create light source object. # convert data to rgb array including shading from light source. 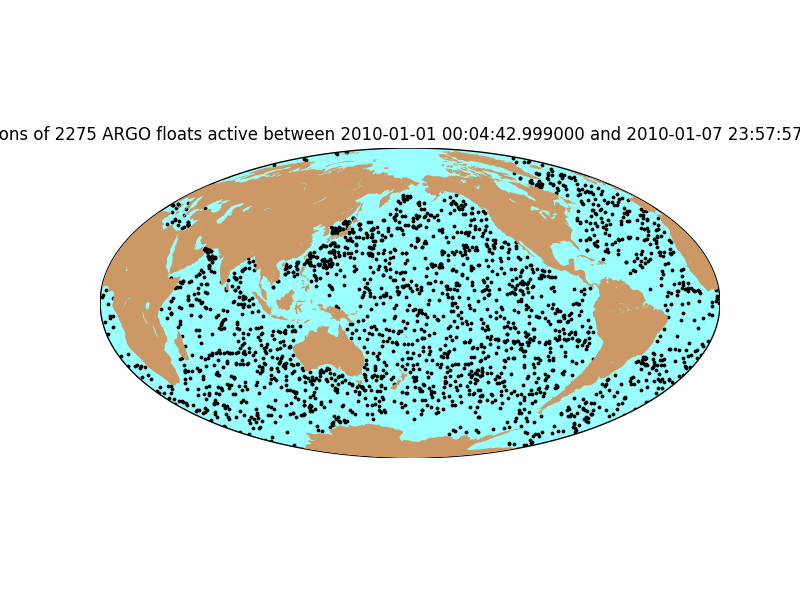 Plot markers at locations of ARGO floats. Pseudo-color plot of SST and sea ice analysis. date = datetime(2007,12,15,0) # date to plot. timeindex = date2index(date,timevar) # find time index for desired date. # missing_value variable attribute. 'squeeze out' singleton dimensions. # read lats and lons (representing centers of grid boxes). # create figure, axes instances. # draw line around map projection limb. # color background of map projection region. # missing values over land will show up this color. # draw parallels and meridians, but don't bother labelling them. Plotting wind vectors and wind barbs. # specify date to plot. # set OpenDAP server URL. # reverse latitudes so they go from south to north. # get sea level pressure and 10-m wind data. # mult slp by 0.01 to put in units of hPa. # set desired contour levels. # compute native x,y coordinates of grid. # define parallels and meridians to draw. # plot wind vectors on projection grid. # in longitude). Otherwise, interpolation is messed up. # transform vectors to projection grid. # draw coastlines, parallels, meridians. # plot wind barbs over map. 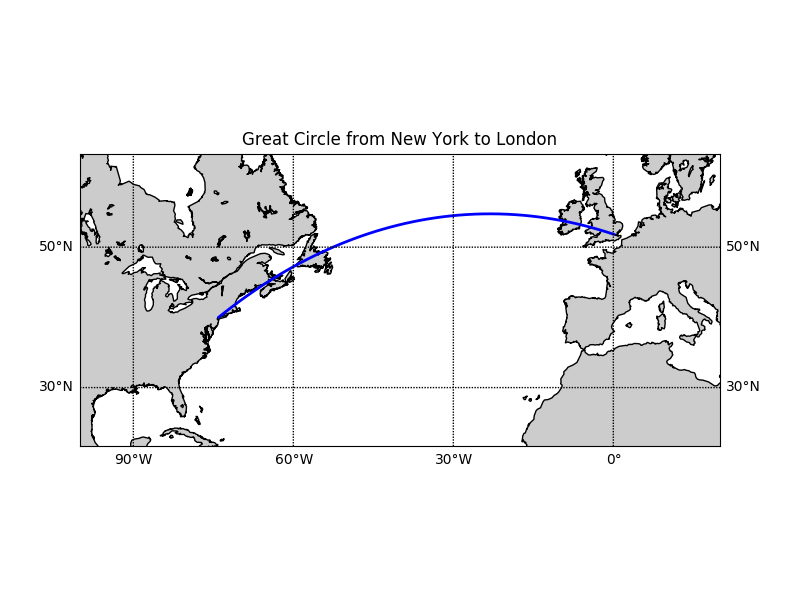 Draw great circle between NY and London. # create new figure, axes instances. # lonlat, lonlon are lat/lon of London. Draw day-night terminator on a map.